Join us for a day tour from Cobh Harbour and get a taste of Ireland for your day in the south of the country. At Classic Ireland Guided Tours we can give you a private tour from Cobh to some of Ireland’s leading attractions and we will return you to your ship in good time for your onward voyage. We will start our tour with a visit to the Jameson Irish Whiskey Midleton Distillery. Here you can take a tour of this facility and learn how good whiskey is produced. Your tour will include a ‘tasting’ of Jameson Irish Whiskey, a most enjoyable experience. 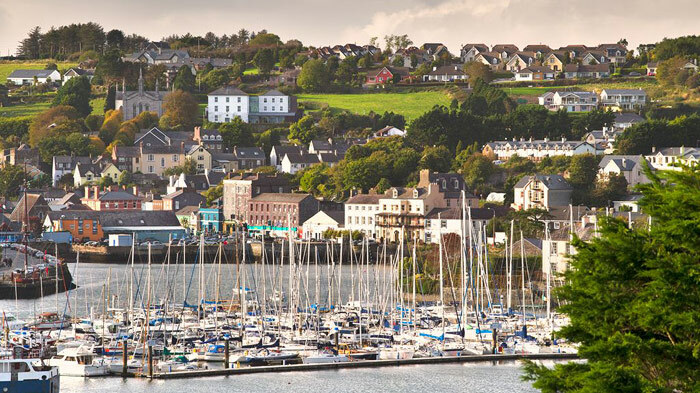 After your visit to Midleton, your tour will move on to the lovely coastal town of Kinsale, Co Cork. Here you can avail of lunch on one of the town’s many fine restaurants. There will be plenty of time to wander the narrow streets of this quaint town for a bit of retail therapy. 2. Blarney and Kinsale or Midleton Distillery: Another full days tour. You will start your tour at Blarney, Co, Cork. Here you have the option of visiting the famous Blarney Castle and Gardens. A visit to the castle gives you the opportunity of kiss the Blarney Stone. Kissing the famous stone will bestow you with the !gift of eloquence’, or as we say in Ireland you will get the ‘gift of the gab’. At Blarney you can avail of the opportunity to shop at Blarney Wollen Mills and have some lunch. From Blarney your tour will take you to Kinsale, Co. Cork. This lovely quaint coastal town is full of narrow streets with many opportunities to browse its many craft and other shops. Alternatively you can opt to travel to Midleton and opt for a tour of the Jameson Irish Whiskey Midleton Distillery. Waterford Crystal Tour: On departing your ship you will travel to Waterford City. Here you will have the opportunity to visit The House of Waterford Crystal and take the factory tour where you will see master craftsmen making beautiful Waterford Crystal. Lunch facilities will also be available at this centre. Muckross House, Killarney and Killarney National Park: Your tour will take you directly from Cobh to Kenmare, Co. Kerry. From here your tour will join the inland portion of the Ring of Kerry. This tour will afford panoramic views of The Killarney Valley, it’s lakes and mountains. Your tour will stop at Muckross House and Gardens. Here you have the option of taking a tour of this ‘Downtown Abbey’ type house. The house was completed in 1843 and its guests include Queen Victoria who stayed here in 1861. Lunch will be available at Muckross House. You will then return to your ship at Cobh Harbour. Your transportation and guided services to all the locations listed. Meals or access to sites where payment is required is not included. If you wish to avail of other possible tour options for your day in Cobh, contact Classic Ireland Guided Tours and we will tailor a day tour for you. The vehicle to be used will depend on the number of visitors in your group. Classic Ireland Guided Tours caters for groups from one to fifty visitors.